It’s the trend that turned everyone’s Insta hair game up a notch, and it’s set to be a firm fav. This one’s all about subtle rebellion, so whether it’s breaking the dress code at work with a hidden rainbow ‘do or straying from that drab school uniform with a geometric undercut - keep that style secret and reveal for maximum dazzle-factor. Weather? Freaking freezing. So the time is nigh to embrace the icy vibes and opt for a cool and minty pastel hue. And if the whole ‘New Year, New You’ reinvention is just a bit too much you can grab our Colour Sprays for a temporary colour that lasts up to 3 washes. Yas! Because it’s the hair equivalent to the timeless LBD - red shades are always, always, always a good idea! Make it pop with bold hues like our Ultra Brights Pillar Box Red, or work a softer shade for winter with our Mango Twist. So. Much. Choice. Naturally darker tresses? Not a prob, because ‘17 is totally your year. 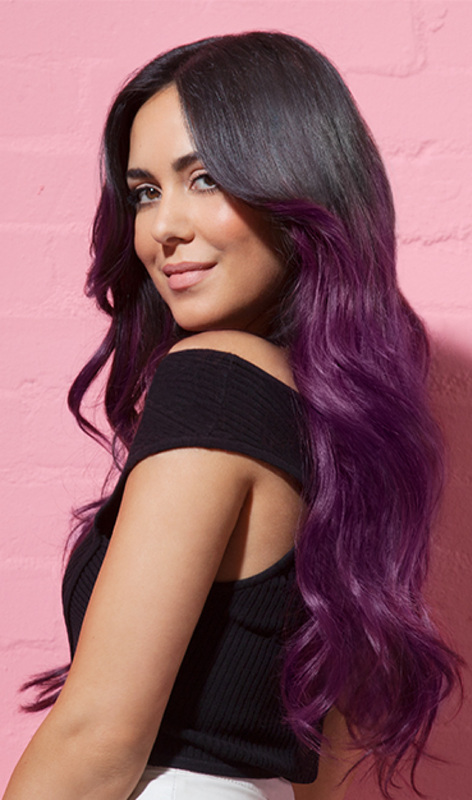 Be it a subtle ombre or a full-head of colour magic, reach for our Ultra Violet shade to get those locks looking vibrant as anything in one easy step. Oh hey colour crush!